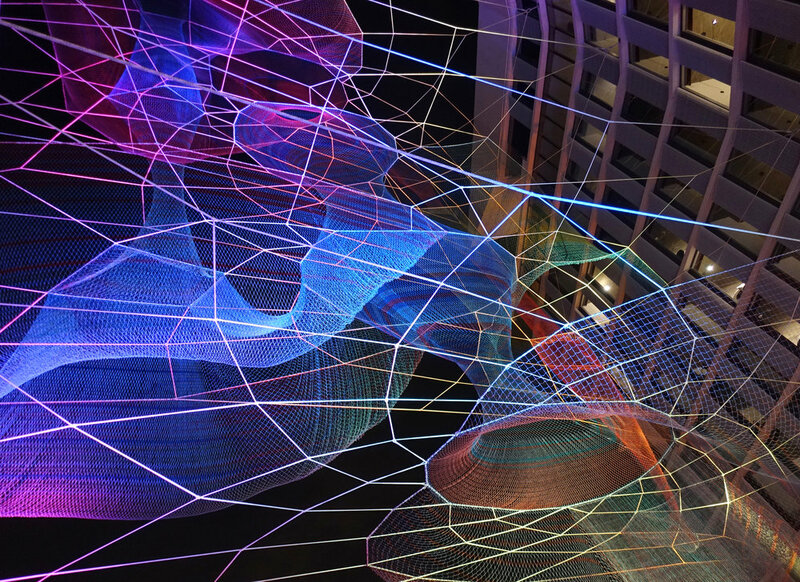 Dream Catcher, Janet Echelman’s monumental sculpture for the Sunset Strip in West Hollywood, transforms the open space between two buildings into a dynamic, translucent art installation. 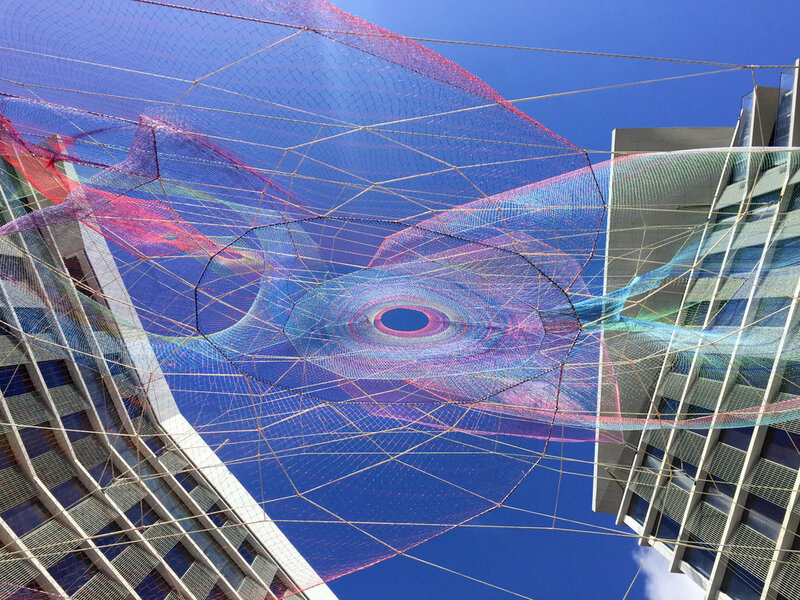 A group of suspended forms composed of colored fiber netting create a gently-moving, transparent sculpture nearly the height of the ten-story buildings. Echelman laces the artwork directly into the architecture of the two adjacent buildings and in doing so created forms new to her practice. 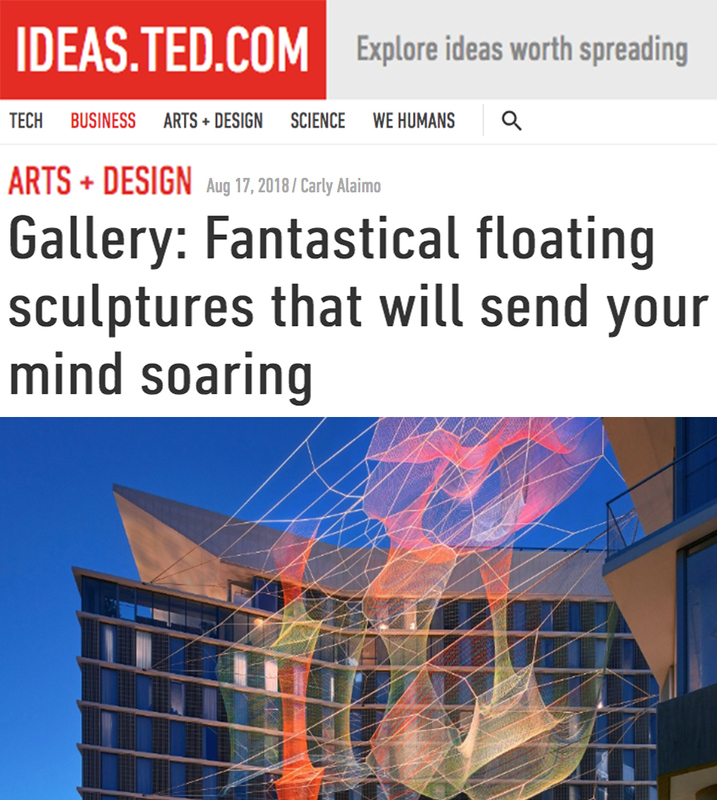 The artwork’s inspiration stems from dreams and the idea of dreaming hotel guests asleep in the two buildings that cradle and support the sculpture. Her studio’s research into brainwave activity during periods of dreaming provided a data set from which they extrapolated the forms that constitute the artwork. Dreams are not only private experiences, they are also social and cultural ones. Dream Catcher is an apt title not only for how it speaks to the guests of the hotel, but to the larger region and its identity as a global epicenter for entertainment and media – the place where dreams are invented and pursued. Dream Catcher is constructed with four horizontal structural layers suspended between two hotel towers. 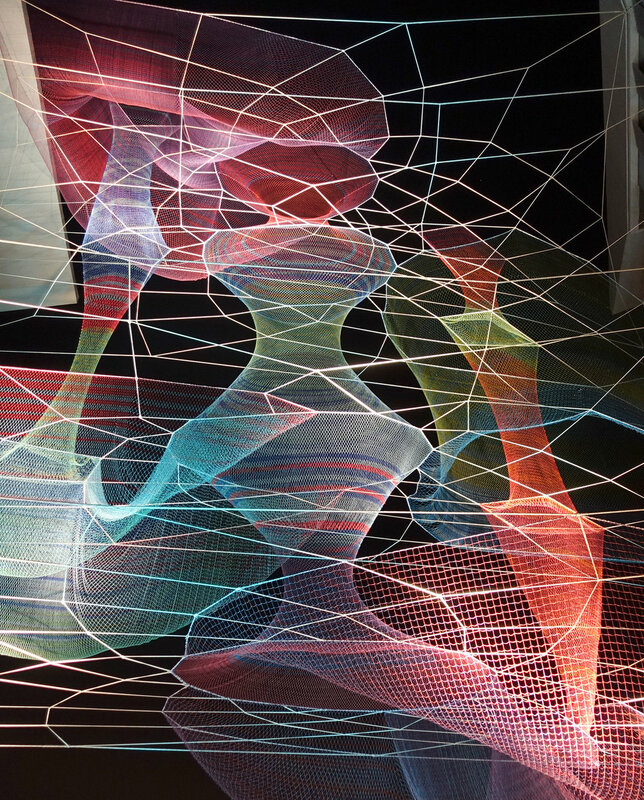 Between these structural layers float colorful sculptural elements which combine both tensioned and draped forms. The specificity of the narrative to the site is matched by Dream Catcher’s unique response to the site’s formal parameters. The highly dynamic environment of the Sunset Strip, including the presence of soaring buildings, demands a work of equal rigor and commanding presence. With a height of 90 feet and a width of 70 feet, the sculpture provides a large visual presence, tempered by its translucency. The chromatic drama of Dream Catcher, particularly at night with its LED lighting design, offers a vibrant, illuminated visual field prominent both from Sunset Boulevard and locations south of the site. The four-tiered sculptural support system is composed of cables that are integrated seamlessly into the building floor plates and represent a highly collaborative, unified relationship between the artist and the architectural team.